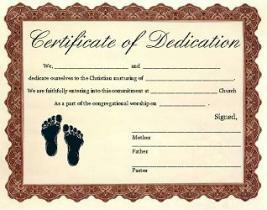 The Baby Dedication Certificate and the Baby Dedication Request and Log Forms are available absolutely free below to instantly download, customize and print 24/7. It's exciting when a new child enters a family. In these joyful moments, pastors have the privilege of sharing how parents can express their full appreciation to God through baby dedication. A ceremony in which believing parents, and sometimes entire families, make a commitment before the Lord to submit a child to God's will and to raise that child according to God's Word and God's ways. There's no greater moment then when the parents sense that children are a gift from God. This certificate for new babies is a precious and priceless memory for new parents. Christian parents who are dedicating their baby are making a promise to the Lord to do everything within their power to raise the child in a Godly way prayerfully until he or she can make their own decision to follow God. I only had one child that the Lord blessed me with but I just couldn't wait to dedicate her to the Lord! There is no greater way to show God how thankful you are for the awesome blessing He gave you than to give that child back to Him. Think about it, they belong to Him anyways. He has given them to us and entrusted us to raise them to Love Him and serve Him, and what a great responsibility that really is but it begins with dedicating your baby to the Lord first. There is a Baby Dedication Request Form below that you can have the proud new parents fill out to request their baby to be dedicated. We have two beautiful certificates below to give to the proud parents after the dedication is finished. The certificate for the new baby dedication will be a wonderful keepsake and/or memory that your church can so proudly give to the proud parents with little to no cost to the church. After downloading the certificate and modifying it for the particular members, print the certificate, if possible, on light-colored (white or beige is better) card stock paper. If card stock paper is not available you can use regular copy paper. The card stock paper will make the certificate look so much better and much more professional because of the thicker paper. You can insert the certificate in a beautiful 8x10 picture frame or you can simply insert the certificate in a sheet protector before giving it to the parents. If you need a Baby Dedication Request form just download it below for anyone in your church to fill out prior to dedicating their baby. If you need a Baby Dedication Log form for your Pastor and/or church to use to track the baby dedications on a log just download it below also. Return to Certificates from Baby Dedication Certificate and Baby Dedication Request and Log Forms.